When Harvard University first introduced RoboBee back in 2013, it could do little more than fly and cling to walls. Come 2018, the same research team has put out a new and improved RoboBee — one that can successfully dive into and burst out of water. The latest in a series of minuscule, flight-capable robots, this RoboBee is a mere two cm tall and has a weight about one-fiftieth that of a penny. Yet it’s fully capable of smoothly leaping into water, back out, and then making a proper landing. In order to achieve this, the team utilized a combination of experimental data and theoretical modeling to find the ideal flapping frequency for the wings in the air and in the water. Too low a frequency would make it difficult for RoboBee to fly after submerging in fluids, and too high a frequency would result in the wings snapping off. They found that 220 to 300 hertz was suitable for aerial flight, and nine to 13 hertz was best for water. Following this, the researchers had to devise a way for RoboBee to break surface tension and leap back into the air. The solution turned out to be a two-step system consisting of a central gas collection chamber and four buoyant outtriggers. Upon swimming to the surface, an electrolytic plate within RoboBee’s gas chamber would convert water into combustible oxyhydrogen which propels the wings and the robot out of water. The outtriggers would then help stabilize RoboBee. At this stage, the biggest limitation of RoboBee is that it can’t fly right after emerging from water due to the lack of on-board sensors and a restricted motion-tracking system. Yet the team hopes to improve on this in the future. One other thing RoboBee has going for it is that it’s a thousand times lighter than any past aerial-to-aquatic robot — meaning that it could potentially be utilized for even more real-life applications, such as environmental monitoring and search-and-rescue operations. 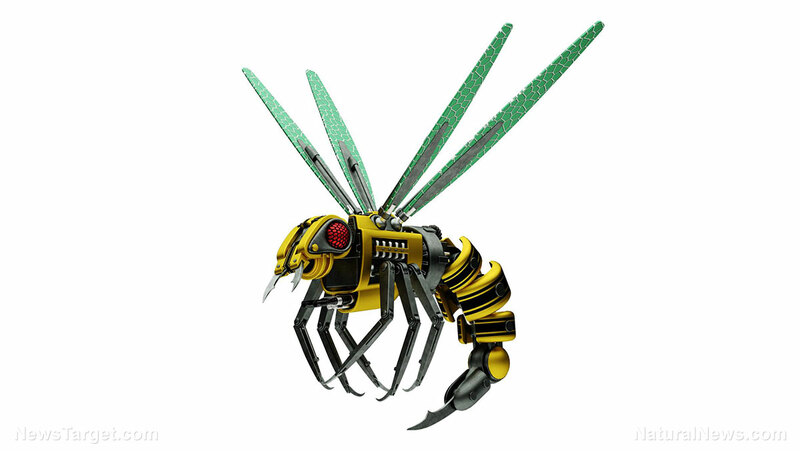 However, this also means that RoboBee could very well be an effective spy. As was brought up in a 2016 article on the Daily Mail, this tiny robot can land on and rest on just about any surface with nothing more than an electrode patch and foam mount. Essentially, RoboBee would be using static electricity to stick to walls, an action that requires way less power than flying. So a RoboBee that has settled comfortably on your ceiling is one that could stay there for long periods of time. Furthermore, at its current size, RoboBee could easily be mistaken for an actual bee struggling to get out of water. This could then present an easy opportunity for a free meal to the likes of woodpeckers, shrikes, crab spiders, beewolves, and frogs — all animals known to prey on bees. But instead of getting a quick meal, they risk mouthfuls of potentially deadly electronics and hardware. Go to Robotics.news and read up on many more stories about robots and artificial intelligence. Walmart files patent for robotic bees, are they planning for future extinction? Hillary Clinton possibly ARRESTED Monday Morning. Is Killary wearing an ankle monitor?